Mechanical keyboards are enjoying a spate of popularity these days, and Logitech has revealed a new one aimed squarely at gamers. The Logitech G410 Atlas Spectrum TKL Mechanical Gaming Keyboard, to give the device its full and rather cumbersome name, is a tenkeyless affair which is lightweight to make it easy to lug around to the likes of LAN parties. Tenkeyless means it has no numeric keypad on the right, which makes it more compact for portability, and it takes up less space on your desk too. We have a tenkeyless mechanical keyboard ourselves, and we like the fact that it enables us to shift the mouse in closer to the keyboard, so we're not having to reach out as far to the right when moving the mouse. We definitely feel this close-knit keyboard and mouse setup is more ergonomic and comfortable for gaming, and for general use, for that matter. Logitech has used Romer-G mechanical switches with the G410, and claims that these register key presses around 25% faster than typical switches for added responsiveness when it comes to that clutch frag in your favourite shooter. The switches also boast improved durability, offering a claimed 70 million keystrokes of longevity, 40% more than some rivals according to the company. As this is a gaming keyboard, of course it comes with RGB backlighting, although this isn't just purely for show as the Logitech software allows you to assign colours to keys to help you remember, say, certain spells in an MMORPG. Finally, the keyboard offers something called the Arx Control dock, a pull-out stand which you can slot your phone or tablet into. The idea is that the device can run the Arx Control app (for iOS or Android) to display important in-game information, statistics and the like, a clever added touch. 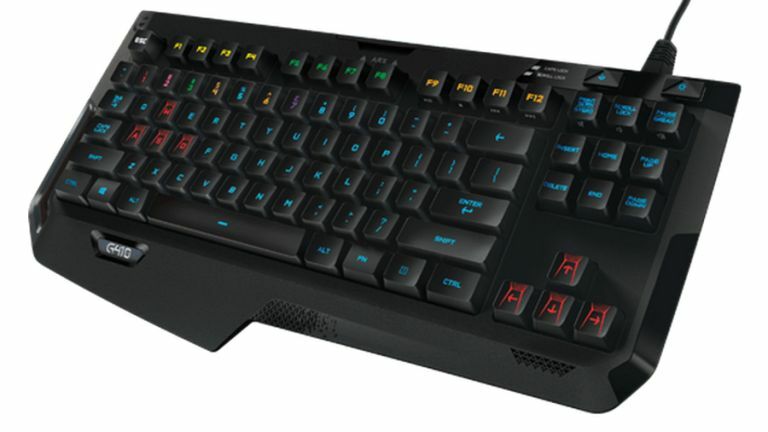 The Logitech G410 Atlas Spectrum TKL keyboard will set you back £120 when ordered directly from Logitech (and that's with free shipping). It's $130 over in the US.